Yesterday's trending topic is all about the COMELEC's voters database breach leaked was a bad nightmare for all Filipino voters. All the information taken from the citizen using biometrics registration have been uploaded by hackers in wehaveyourdata's website and now been searchable along the internet and exposed to the public around the world. 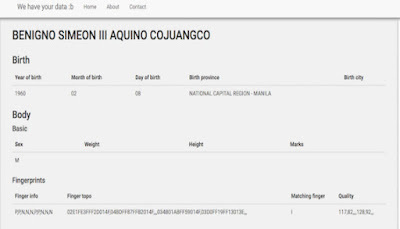 Filipino voter's who have information in the said website are now prone to hackers and different cyber attacks prior to the COMELEC's database breach leaked issue. So, I decided to compile all the possible attacks you are vulnerable and how to prevent it. Info: Attackers impersonating as you to gain access to your accounts. Normally, attackers are using wireless communication like chat support, voice calls or via email. How to prevent: Contact your service provider and make arrangements for your accounts, ask them to call your provided telephone/mobile number before they approve trasaction from a suspicious user activity. You can also demand to add verification process if needed. Info: A third party is trying to gain access into your accounts by cracking the user's password. How to prevent: Your birthday is a terrible password idea, along with your address. So change it and don't use it! Info: This might be use as an extra security to your bank accounts, verify the users identity as legitimate owner, and might be use in retrieving lost or forgotten password. How to prevent: Since your address, birth place and mother's maiden name are showed on the said website, never ever use it now. I warn you! You may add some tweaks to your security question's answer by putting extra characters or numbers. Oh, being a victim of hackers is something I would never want to happen. Great tips! Thanks for sharing this preventive measures. This is a great share! Hackers are hidden menace these days. Wow, thanks for sharing the authorities to call in case such matters arises. Nice tips. One great danger is phishing where you get redirected to a login page very similar to a website, ex. Facebook. Once you enter your login details thinking it's really Facebook, your login details are sent to the hacker. So, it is better to check the url of the website before entering your details. Thank you for the helpful tips. But I think hackers have more strategies than just guessing our password right? Yes. The most popular is Phishing websites. Where you are redirected to a fake login page of popular social media sites like Facebook and Twitter. Wow! Great read. Thanks for sharing this. So helpful! Been changing all my passwords lately, just to be safe. I'm always worried that I'll forget my passwords though hehehe. When my Paypal was hacked before and my money were transferred to a different paypal account, I was alarmed. I did all the necessary precautions and yet, I was hacked. Good thing, I was quick enough to change password and all and realized I need to always change it every now and then. Nice tips to prevent getting hacked. Even before the COMELEC fiasco, hacking is fairly normal nowadays. I receive emails fishing for my personal information quite a lot, good thing I can discern the fake ones from the legit ones. Tsk tsk. Such a helpful post! In a world where social security has a really big threat, information like this is really a must-know. We should all be knowledgeable since we are one of those that are really active in the internet world hence, we are also one of the possible prey.